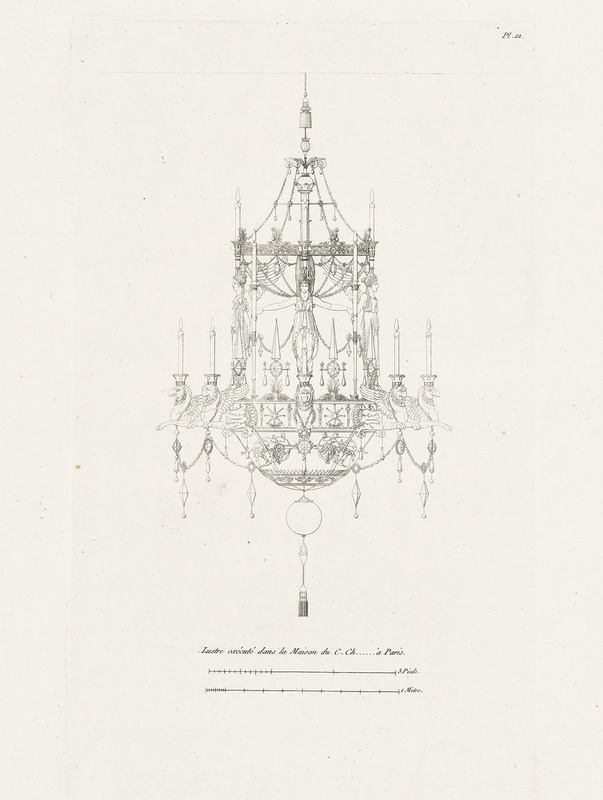 The story behind the unusual form of a French chandelier made in the early 1800s. 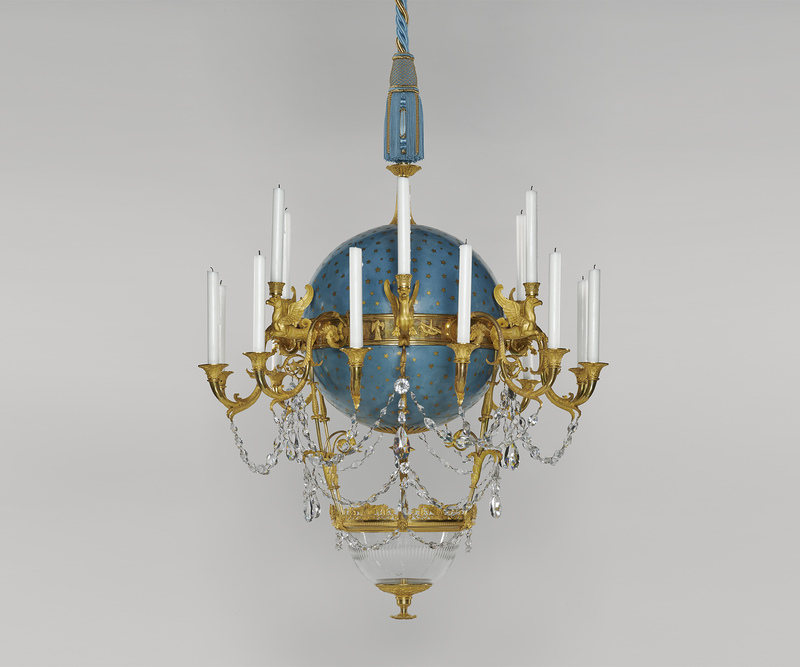 One of the most popular objects in the Getty Museum’s collection of decorative arts is a chandelier made in Paris during the early 1800s by Gérard Jean Galle, an artist who produced luxury items out of gilt bronze. The chandelier is a work of extreme novelty: it has 18 candles for illuminating a room after dark, and includes a glass bowl intended to hold water and small goldfish. Galle described how the swimming fish would amuse the viewer. This idea reflected a design theory at the time suggesting that objects should be not only functional but also gratifying to the eye and the imagination. The fanciful nature of the chandelier would truly come to life when the candles were lit and fish were added to the bowl. Imagine how warm and lively candlelight would reflect off the gilt bronze, the faceted glass drops, the water, and the moving fish to animate this remarkable object—presenting a fascinating spectacle for the work’s owner and guests. 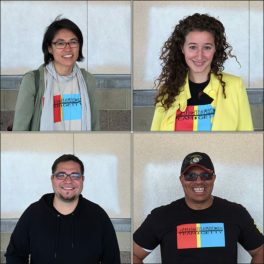 The chandelier continues to delight viewers, and is the centerpiece of the exhibition Flight of Fancy: The Galle Chandelier at the Getty Center (April 9, 2019–April 19, 2020). The design of the chandelier represented modernity at the time it was made. The overall form suggests a hot-air balloon—think of the blue globe as the balloon and the glass bowl below as the basket for passengers. Hot-air balloons, initially developed in France in 1783, were still marvels of technology in the early 1800s. 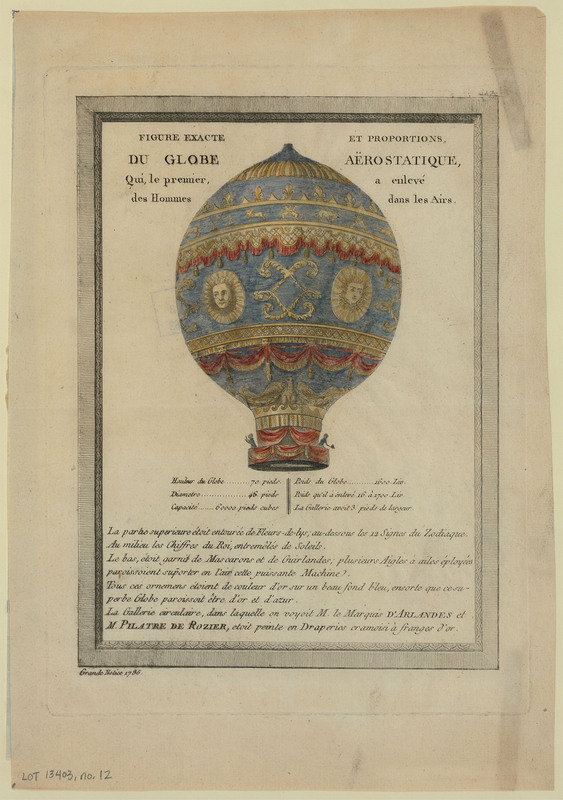 The print reproduced below documents the first untethered hot-air balloon ride, launched from a large park in Paris (Bois de Bolougne) on November 21, 1783. (Notice particularly the signs of the zodiac along the top of the balloon, a decorative element that features prominently on the Galle chandelier.) They were the first vessels to carry humans in flight, a critical step in the history of aviation, and the sight of these enormous vessels (roughly 70 feet [21 meters] high) floating silently overhead left an indelible impression on the public for generations to come, much as space travel has done for us. Hot-air balloon launched outside Paris on November 21, 1783. French (Paris), 1786. Hand-colored etching. Library of Congress Prints and Photographs Division. Tissandier Collection. As did other artists in the early 1800s, Galle adapted motifs from ancient art to a modern furniture form, creating a new design. The graceful, symmetrical model of the chandelier suggests the harmony of ancient Greek and Roman art. 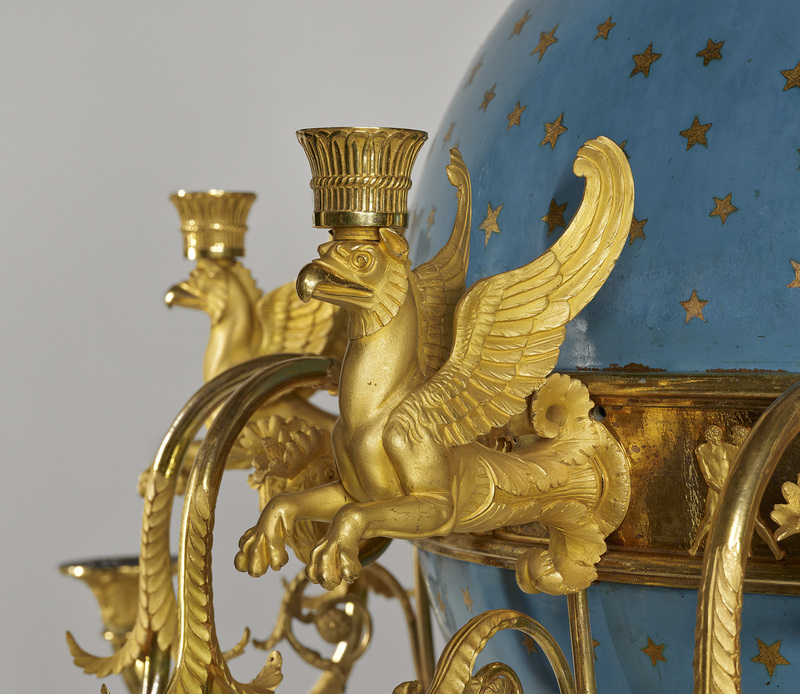 Each part radiates from the central globe and includes classical motifs such as griffins, eagles, and palmettes. 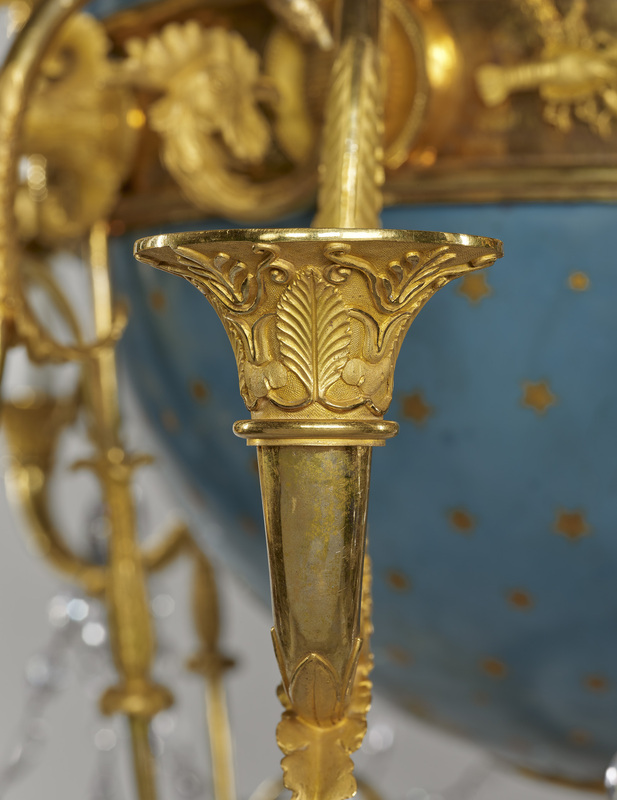 The blue globe has gilt stars and is encircled by a gilt-bronze band bearing the 12 symbols of the zodiac, the ensemble representing the heavens. Moreover, various aspects of the chandelier can be seen to refer to the ancient concept of the four elements: fire (candle flames), air (griffins), water (bowl), earth (plant motifs). All these features were incorporated into a shape related to the contemporary marvel of the hot-air balloon. By merging the old and the new in this way, Galle created a unique design that reflects the fashionable taste of his time. Detail of the Galle chandelier. Upper candleholders in the form of griffins, mythic beasts that are part eagle and part lion. Digital image courtesy of the Getty’s Open Content Program. The objects that make up the display of Monsieur Galle, are a small chandelier of new form, candelabra, firedogs, many clocks, and a centerpiece composed of twenty-four pieces; all these works are tasteful and well executed, the centerpiece is very beautiful. 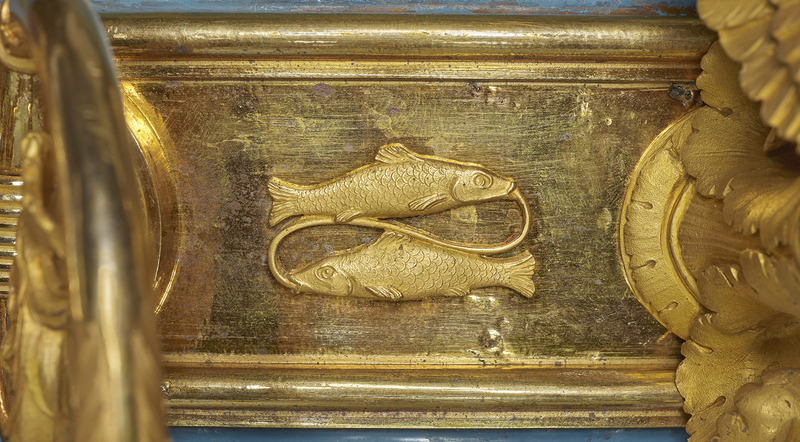 Detail of Pisces from the Galle chandelier. Digital image courtesy of the Getty’s Open Content Program. Fish chandelier. In the middle of a blue enameled globe scattered with stars is a circle with the signs of the zodiac and six griffins carrying candles … [Below is a glass bowl fitted with] a plug intended for the removal of the water, which one places in the bowl with small goldfish whose continuous movement will give agreeable recreation to the eye. Galle was not successful in this appeal and struggled financially throughout his career. Despite that, he continued producing high-quality objects in gilt bronze and was awarded a gold medal at the Paris Exhibition of 1823. 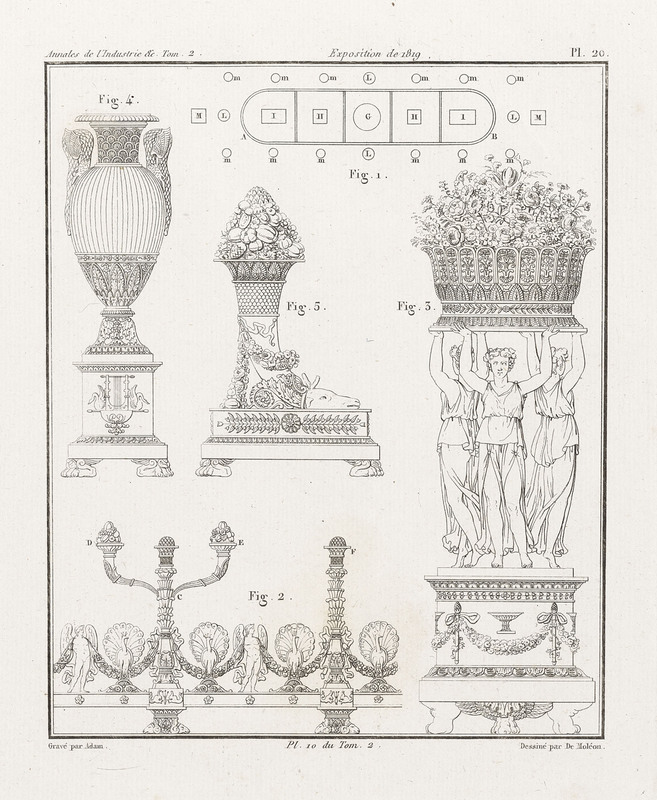 Elements for a centerpiece designed by Gérard Jean Galle. Detail from a page in Description of the 1819 Exhibition, 1821, by Jean Gabriel Victor de Moléon. Etching. The Getty Research Institute, 1355-095. 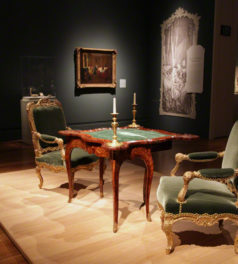 The exhibitions of the products of French industry held in Paris during the first half of the 1800s were intended to unite art and industry in the pursuit of progress and modernity. The 1819 exhibition was the first to take place in the Louvre palace. It included 1,662 exhibitors and ran for thirty-five days. A contemporary album illustrates a small selection of the items displayed in that show, including the elements for an elaborate gilt-bronze centerpiece by Galle that received particular praise from exhibition jurors. Galle’s design reflects the influence of prominent designers of the early 1800s, which spread widely thanks to portable prints and design books. As seen in the Galle chandelier, the fashion was to adapt motifs found in ancient art and architecture to new furniture forms. The French design partners Percier and Fontaine wrote that they regarded models from classical antiquity as examples “not to be followed blindly but in keeping with modern customs, usage, and materials.” They were the leading designers under Napoleon I, known particularly for their publication Collection of Interior Decoration, a suite of prints begun in 1801 that dominated the Parisian scene for the next twenty years. Included in that work is a design for a chandelier that has candle supports in the form of griffins, suggesting a possible source for the similar element on Galle’s chandelier. Design for a chandelier. From Recueil de decorations intérieures (Collection of Interior Decoration), Paris, 1812, by Charles Percier and Pierre François Léonard Fontaine. Etching. The Getty Research Institute, 83-B3068.c3.pt2.pl12. The Galle chandelier also embodies a standard noted by the English author and furniture designer Thomas Hope, whose influential book Household Furniture and Interior Decoration was first published in 1807. Hope wrote that while a design’s primary purposes should be function and comfort, it may also include attributes of elegance and beauty that “enable its shape and accessories to afford additional gratification, both to the eye and to the imagination.” The book includes an illustration for a chandelier of bronze and gold that may also have inspired Galle when he made similar griffin figures for his own chandelier. 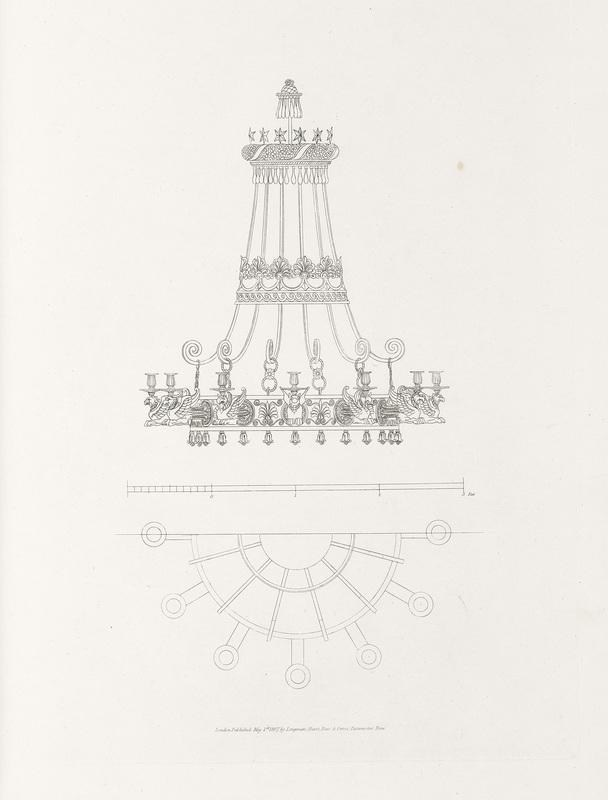 Design for a chandelier in Household Furniture and Interior Decoration, London, 1807, by Thomas Hope (English, 1769–1831). Etching. The Getty Research Institute, 88-B10166.c2. Detail of the lower candleholders decorated with palmettes, a motif resembling flattened leaves, from the Galle chandelier. Digital image courtesy of the Getty’s Open Content Program. In our brightly electrified world, it is difficult to understand how important candleholders were to the furnishing of a room. They were not just decorative but provided an essential function to light the hours after daylight. In France during the early 1800s, the most prestigious type of candles were made of beeswax that had been carefully filtered and bleached in sunlight to obtain a pure white color. Such candles were expensive, so it is not surprising that lighting fixtures were sometimes made of costly materials where elements like bright gilding and glass drops would enhance the sparkle of the candlelight. Given the costly nature of candles and the fact that goldfish would not be able to survive for long periods in the suspended bowl (they would need to be transferred to and from a more hospitable environment such as a tank or pond), the Galle chandelier was not meant for everyday use. It would only be fully lit and occupied with fish on special occasions, providing a novel showpiece for visitors. The performative nature of lighting is something we all still enjoy at special events and installations that evoke celebration. The sense of spectacle and entertainment was also an important element of the early hot-air balloon flights. They were regarded with particular pride by the French, who had pioneered this type of aeronautics, and were often included as prominent aspects of civic festivals. 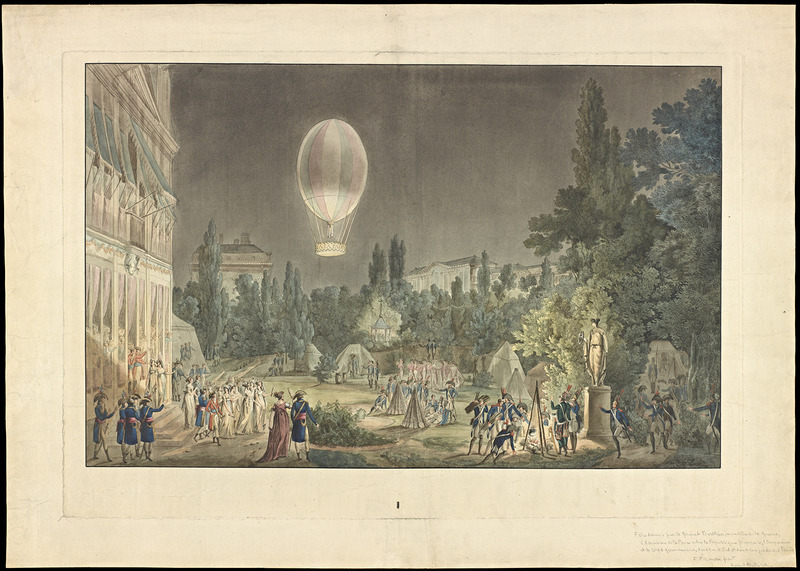 A print from the time shows a striking example of dramatic lighting combined with a hot-air-balloon display to provide special meaning and atmosphere to a contemporary event. The scene depicts an evening party at the Paris home and garden of General Berthier, minister of war, in 1801 to mark the peace between the French Republic, the Holy Roman Emperor, and the German people. Strategically placed fires and lights illuminate the façade of the house, the garden sculpture, and the base of the balloon that bears the message “A LA PAIX” (for peace) on the basket. The Galle chandelier achieves a similar result. It is an object of wonder that conveys a celebratory sense of creation and aspiration through a form and decorations that reference light, flight, and the universal elements of nature. The unique harmonious design evokes the past and the future while providing stimulation for the eyes and the imagination of all who see it. I'm associate curator of sculpture and decorative arts at the J. Paul Getty Museum and co-curator of the installation Louis XIV at the Getty.